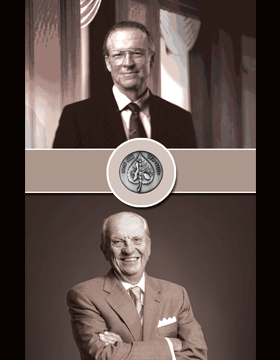 This year’s Georgia Trustees – the state’s highest honor – go to two men with a common vision: making their community a better place. Georgia’s New Trustees: From top|! !| Duane Ackerman|! !| former CEO of BellSouth; and A.D. “Pete” Correll|! !| former CEO of Georgia Pacific. A look at the list of people who have been named a Georgia Trustee, the state’s highest honor, reveals a small group of leaders who have had a profound impact on our state in every sector, from business to sports to education to healtcare and philanthropy. This year’s additions to that elite group are no exception. Duane Ackerman, former BellSouth CEO and a man who lent his considerable talents to helping protect our nation from cyberattacks, and A.D. “Pete” Correll, former CEO of Georgia-Pacific and more recently the man who saved Grady Hospital, are naturals for the honor. “I think they share a common vision for the community being a better place and realize that it’s only going to be a better place if they themselves step forward, take the lead and make it happen,” says Todd Groce, president of the Georgia Historical Society, which, along with the Office of the Governor, names the trustees. Ackerman and Correll will be honored for their achievements Saturday, Feb. 18, at the historical society’s Trustees Gala in Savannah, part of its annual commemoration of the state’s history. The original trustees were chartered by England’s King George II in 1732 and charged with establishing the new colony. The group disbanded in 1752, but the state re-established the honor in 2009 to recognize contemporary Georgians. The original motto of the trustees, Non Sibi Sed Aliis, which means “not for self but for others,” steers the selection process each year toward people whose lives and accomplishments have made the state a better place. When Duane Ackerman joined the old Southern Bell Corp. in 1964, he was told if he behaved himself it was a stable job for life: Nothing would ever change. “How little we knew,” he says. And how fast he and his colleagues had to learn. Over a long and distinguished career in telecommunications, Ackerman led his company and his industry through dazzling changes in technology that transformed business, government, entertainment and social interaction. Then he directed his attention to cybersecurity and making those changes safer. Ackerman, 74, grew up in Plant City, Fla., and has undergraduate and graduate degrees from Rollins College and a master’s from the Massachusetts Institute of Technology, where he was a Sloan Fellow. For his business leadership and civic involvement, F. Duane Ackerman has been named a 2017 Georgia Trustee, the state’s highest honor, given jointly by the Governor’s Office and the Georgia Historical Society. The trajectory of change in Ackerman’s industry and his own career was both fascinating and hair-raising, he says. The pace was breakneck. After several years of antitrust litigation, AT&T was forced by the U.S. Justice Department to divest itself of its local systems, including Southern Bell, which in 1983 became BellSouth Corp., the holding company for phone businesses in the Southeast. Ackerman became the new company’s vice president for corporate planning and development and rose quickly through the ranks. He was named president and CEO of BellSouth in 1997, then added chairman’s duties the following year, serving until the company merged again with a new version of AT&T. Changes in technology and the regulatory environment – especially the deregulation that came as a result of the federal Telecommunications Act of 1996 – meant changes in the way business was done. The two biggest drivers were wireless and the internet, he says. “Both of those certainly outmoded all the technology we had. Here we had huge capital bases we were trying to earn on and all of this new technology coming on that just antiquated all of it. We had to run extremely fast once the technology began to break. After the original AT&T breakup, BellSouth became the rock star among regional phone companies, very early on taking steps – including the installation of optical fiber in local networks – to ensure it was prepared for the technological innovation that was to come. Advances in technology helped fuel industry deregulation, which brought still more advances. “Competitors began to come in,” he says. “They were bringing in new technology. We were trying to serve the old technology and develop the new technology, so all of this dramatic change started taking place, starting in the early ’90s. It began shortly after the breakup [of the Bells], but by the early ’90s it was in full swing. It was dramatic, it was fast and the race was on. We were racing against technology as much as anything. Clearly, Ackerman thrived amid the changes and challenges, and he says there never was a point at which he felt he and his company could slow down. For the future, Ackerman believes the telecommunications industry will see more growth – and will continue to grapple with security issues. That means more security threats to the industry and its consumers. New developments and new capabilities mean new vulnerabilities. Ackerman became a member of the National Telecommunications Security Advisory Council in 2004, when he was appointed by President George W. Bush. Two national tragedies – 9/11 and Katrina – had a strong influence on Ackerman and the direction of the later part of his career, when he became heavily involved in cybersecurity: “9/11 because it was on our watch,” he says. “The impact and focus of our country at that time changed dramatically. “The other was Katrina. We served New Orleans. When Katrina hit and the levees broke and we got that tremendous wall of water going inside New Orleans, we had to put the telecom structure back together again. It gave us an insight into what it could be like in a major city if you had a disruption. In this case it was water, but it could be a lot of other things. I think that influenced me greatly. He is asked where we are in the struggle for security. “I think you have to say we are vulnerable. Part of it is our technology has run so fast we’re probably a little ahead of our ability to protect it,” he says. “I think we grow and learn and protect; and technology continues to move, both on the good guys’ side and the bad guys’ side. His concerns extend beyond any one company or even one industry. Ackerman is keenly aware of how wide and deep the effects of technology are. “We’re in a new environment socially as well,” he says. “The election we just went through is an example: the technology, the capability continually to change. We continue to try to adjust and keep up with it, and it’s changing extremely fast. “Sit around with your teenagers and try to get a conversation going and try to get them away from their mobile devices. Or your grandchildren. It’s changed our families, changed the way we shop, changed the way we market, changed the way we try to run our businesses, changed the way we try to run our governmental institutions. “When you look at the impact technology is having on society,” he says, “I think we have a lot to learn. We can’t put the genie back in the bottle, so how are we going to function? It amplifies our differences, creates an environment for people to use it to bully, creates an environment for bad guys to gather – think about the terrorism we see. It also creates enormous capabilities for us socially that have good outcomes. Yet there is no governance of this. How do we in fact learn to function as a family, as corporations, as governmental institutions with all this information that is instantaneously available immediately. I think that’s a challenge for us as a society – there is work to be done. We’ve all got to learn how to function with this immediate communication capability. Duane Ackerman’s story is far more than the sum of his business accomplishments. It can’t be told without noting his civic and philanthropic activities and his involvement in the business community at large – including past service on the boards of The Home Depot, UPS and Allstate and current involvement with the Georgia Research Alliance venture fund – called GRA Ventures – which connects private capital with innovative ideas coming out of Georgia’s research institutions. He is a past GRA chairman and was active with the Boy Scouts and the Atlanta Neighborhood Development Partnership, which promotes affordable housing. “Giving back is part of the American way,” Ackerman says. “When you look at de Tocqueville and what he wrote about the difference in America – it has a lot to do with how we treat philanthropy and what we do. “Some of it’s giving back to your community and making it a better place to live. This is not only where you work but where you live, where your family lives. Reaching out to extend a hand both corporately and individually – where you can make someone’s life a little easier – always creates a benefit for the community and, in the end, the corporation as well. When asked who inspires him, who has influenced him the most in his life, A.D. “Pete” Correll, former CEO of Georgia-Pacific and the man credited with saving Grady Hospital, says, without a doubt, his mother. It’s a bit of wisdom that has carried him through a successful career and some would say an even more successful retirement. It also inspired his selection by the Georgia Historical Society (GHS) and the Office of the Governor as a 2016 Georgia Trustee. Correll grew up in Brunswick, where his father managed a JCPenney store before opening his own, Correll’s Men’s Shop. After his dad passed away, he and his mother continued to run the shop until Correll went to college. It was the beginning of his business education and career – and it taught him that in business, cash is king: The goal, he says, is to have more on hand at the end of the day than at the beginning. Apparently there weren’t enough girls – or maybe just not the right girl – hanging around the New York Stock Exchange either, because after working there for a year, he headed back home to the University of Georgia on an academic scholarship. He graduated with a degree in business and moved back to Brunswick with his wife, Ada Lee, whom he met at UGA. “I went to work doing what my father had done and what I thought I wanted to do, which is working for the JCPenney Company in Brunswick, Georgia,” Correll says. But he was working hard, long hours for not much money. With the encouragement of the two women in his life, he began to look for something more. He wrote to Westvaco, now WestRock, in Covington, Va., his mother’s hometown, to see if they had any need for a salesperson or business analyst. And it was there he found his calling. His love of the pulp and paper business led to positions with other companies and in other parts of the country. Pete Correll found himself between jobs in the late ’80s and made a call that would change his life, the lives of his family – and lives of thousands of Georgians, as well. Correll started off at G-P with a bang – and a speech that came to be known around the company as the seven points of light speech. • “Cash drives the system. Who cares about operating earnings? That’s accounting. You have to pay your bills. • “Your customer sets your quality level, we don’t. If a customer says your quality level is not up to par, it’s not up to par regardless of what we think. • “I was a big believer in people, and I believed in doing a lot of interaction with the hourly workers. Years later, Correll still believes those same things – and is still amazed at the impact his ideas had. It took more than a list of good ideas to create the Georgia-Pacific people know today. It took hours of hard work – Correll is known for routinely working 70-hour weeks. But it paid off. Correll says there were two decisions he made about the company that were instrumental in its growth. But it wasn’t all smooth sailing and obvious – at least in hindsight – decision-making. There were challenges to deal with as well. And Correll steered G-P through those, too. “The biggest one by far was asbestos,” he says. “We’re the only company in the history of the United States that caught the asbestos disease and did not go bankrupt. At the peak, we had 150,000 active asbestos suits from a little company Georgia-Pacific bought in the 1950s, whose total sales were $100,000. It was the mud you put on the seams of wallboard. The asbestos was in there to make it stay on the wall – it was a fiber to hold it on the wall. We ended up with suit after suit after suit.” And it’s still in litigation, he says. Correll’s confidence grew G-P so well that he grew himself out of a job. When Koch acquired the company in 2005 – at $48 a share, a far cry from the $9 days – he stayed on to help with the transition but soon found himself without somewhere to go every day when he retired in 2006. It’s a tough spot for a workaholic. He was a man who needed something to do, and he found it in Grady Health System. “Grady, in the final analysis, swamps everything I’ve ever done in my life,” he says. In 2008, Grady, a public hospital owned by the Fulton-DeKalb Hospital Authority, owed money – $60 million – to everyone, including Emory and Morehouse medical schools that provided staff, pharmaceutical companies and vendors; and hospital employees were constantly worried about being paid. The authority had been through four CEOs in five years and had named a legislator and attorney, who had no hospital experience, the most recent chief. Talk swirled about closing Grady, until Correll and other business leaders decided that Atlanta and Georgia couldn’t afford for Grady to go the way of other public hospitals around the country. And like so many good stories, this one starts with two men walking into a bar. As it turned out, it took a lot of talk, a lot of listening and a lot of getting other people on board. The fix was long, complicated and centered on restructuring the governance of the hospital – taking the day-to-day operations out of the hands of politicians. Once the new governing body was set up, the goal became to upgrade facilities and change the image of the hospital, and again Correll was helping lead the charge, spearheading a $350-million fundraising drive for the hospital. As a result, the Marcus Stroke & Neuroscience Center opened in 2010; the Marcus Trauma Center followed in 2011 (both funded by the Marcus Foundation); and in 2013, the $7-million Correll Cardiac Center opened thanks to the Corrells. All have helped shift the public’s perception of the hospital. With Grady well on the road to recovery, Correll stepped down as chair of the corporation in September, though he still chairs the Grady Health Foundation. “I think I can still help them raise money for a while,” he says.